These easy almond butter cookies only take 4 ingredients and are gluten free too! An easy, healthy cookie your whole family will love. 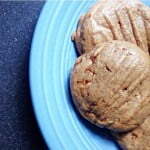 Mix nut butter with Swerve sweetener. Add Torani syrup if using. Add the beaten egg and mix well. Spoon mixture onto a cookie sheet lined with parchment paper. Spread the mixture to flatten the cookies. A fork dipped in water works well here. The cookies will not flatten and spread on their own. Bake for 10-12 minutes. Let cool then eat!